Moving to the Northwest Territories - Compare Movers & Save up to 70% ! The Great Northwest is one of Canada’s less explored territory mainly because it sits far North between the Yukon and Nunavut. The climate is considered between subarctic and polar and this kind of living is not for everyone. However, recently Canada has opened gas and oil exploration in the Northwest which has become quite an attraction to challengers seeking profitable employment opportunities. Intlmovers offers you a very useful way of finding companies and requesting free quotes from international moving companies who specialize in moves to the Northwest. They utilize special contacts and know how, as well as taking advantage of their extensive networks, to get you and your family relocated quicker and easier! If you would like to compare international moving quotes quickly and easily, Intlmovers can request up to six quotes automatically for you. We match your departure location in Canada with your destination state in the USA, and present you with a list of profiled movers that are able to assist you. 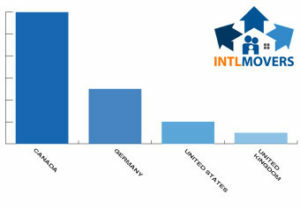 You can save time and money by requesting free international moving quotes with Intlmovers. The Northwest Territory is sparsely populated and has just over 19,000 people in the province largest city Yellow Knife. The people living up in the Northwest are primarily 50% Native Tribes, with a mix of English, Scottish, and Canadians. The Territory is made of communities, and many of these communities are run by and populated by native people. The climate in the Northwest is very cold that’s because this province sits in the arctic circle and winter can be around -20°C/-5°F to -50°C/-20°F but the short warm summers are actually quite enjoyable and reach around 21°C/70°F to 24°C/78°F. The economy in the Northwest is mainly driven by the mining industry. In fact several of Canada’s largest mines are in the Northwest including Diamond mines, silver, copper, gold and Uranium. The Northwest does offer attractive employment opportunities’ for those skilled in geology and mining. There is currently active oil field in the Northwest and recently new explorations for oil and gas have been underway for new possibilities. Living in this part of the world is like living in a small town. That’s because the most communities are small from only a few hundred to just over a thousand people. It helps to belong to the community as many people depend on each other during harsh conditions. 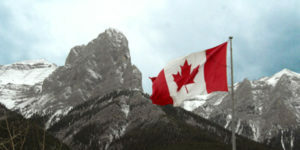 The days may be cold but the harts are warm, It is said this is one of the friendliest places to live in all of Canada. Getting a visa to live and work in the Northwest is the same as getting a visa to live or work in Canada. You must apply with the Canadian Immigration Service or get nominated by a Canadian sponsor. Getting nominated by a Canadian sponsor will reduce the time it takes to get your application approved. There are different visas available depending on what category you fall under. Canada uses a points system to calculate your ability to contribute to your community. There are also some occupations that are in excess and may be difficult to obtain a work permit for. The global location and extreme cold place difficulties on the cost of living in the Northwest. Getting supplies and materials to build homes is difficult and expensive. It cost four times the amount to build a home in the Northwest as it would in any other Canadian province. You have to also take into consideration that homes need to be built to higher standards for extreme weather. Getting consumer goods shipped up North during the winter months can also be difficult to impossible at times. To offset the cost, wages are higher than average in the Northwest and employers often pay bonuses or signing fees to get skilled workers to move the North west. Yes they have several golf courses! Being able to compare a number of quotes at the same time is a great way to see your options and make a better informed choice for your international move from Canada to the USA. Whilst you can receive up to six customized quotes for your international move, all quotes supplied via the Intlmovers quote comparison service are supplied completely obligation free. Should you not wish to elect any of the companies who respond to you, it is completely your choice.